Are you looking to install a concrete pool in your home but worry you do not know enough about concrete pools to install one? If yes, we are here to tell you all about concrete pools. Read below to learn and get started on your home’s new addition. When you have a pool of your own, you are able to get a good exercise daily or weekly. It is a place of fun and relaxation after a long day of work. If this is your first time installing a pool, then we highly recommend you installing a concrete pool. Concrete pools are very durable, affordable and will fit perfectly in a home setting. Before you get started on the construction of your pool, you need to select where to build it. A professional contractor can choose an appropriate area for your pool to be constructed. A contractor will usually pick the best area to locate your pool based on where the best plumbing can be installed. The main determinant for the price of constructing your pool will be where it is built. The area defines what the size will be and what features you have the privilege to have as additions to your pool. Concrete pools are cost effective in the long haul but the initial constructing cost can be hefty. It all depends on whom you hire and what materials are used in the project. There are varieties of benefits that come with having a concrete pool. You can choose any type of design and shape because concrete can easily be used to make custom fits. A concrete pool is spacious than most pools. Concrete pools can have steps. Concrete pools can have many tile varieties that can be installed on the walls and floors of the pool. You can even have a waterfall installed. This will give your pool a classy and authentic look that can last for years to come. 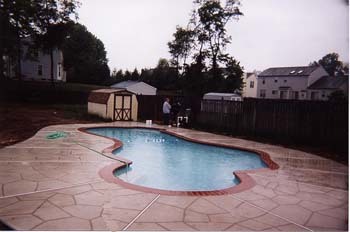 For more information on concrete pools, read this article from ArticleBase.com. This entry was posted on Monday, July 29th, 2013 at 7:40 am. Both comments and pings are currently closed.